A number of ferries operated across the Brisbane River before the arrival of the first Victoria Bridge in 1865 and then the Grey St and Story Bridges in the 1930s. The second Kangaroo Point ferry commenced operation circa 1845 with a horse-drawn punt traversing the river to Holman Street. Around 1919 a terminal was constructed for a cost of £34 to provide shelter for ferry passengers at that river crossing, and here it is. 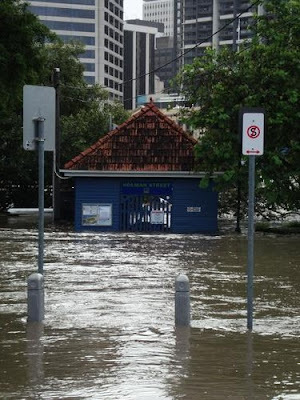 The old terminal did not escape the terrible 2011 floods. Here is a picture of it well under water last January. The river is on the far side of the terminal - all the water in the foreground is floodwater. The rain finally stopped and the flood retreated, and Queenslanders set about cleaning up. Arguments about insurance claims and criticism of how long it took to send the millions of dollars worth of donations to the needy continue still. Many have not been able to return to their houses, and many more are living in unrepaired houses. What happened to the ferry terminal, after the bridges were built? Was it used for anything else? It is still a ferry terminal.